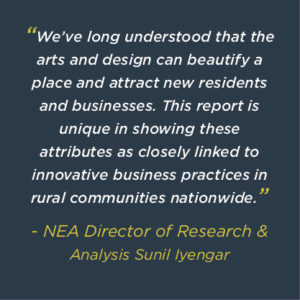 Last month, the National Endowment for the Arts (NEA) released Rural Arts, Design and Innovation in America: Research Findings from the Rural Establishment Innovation Survey. 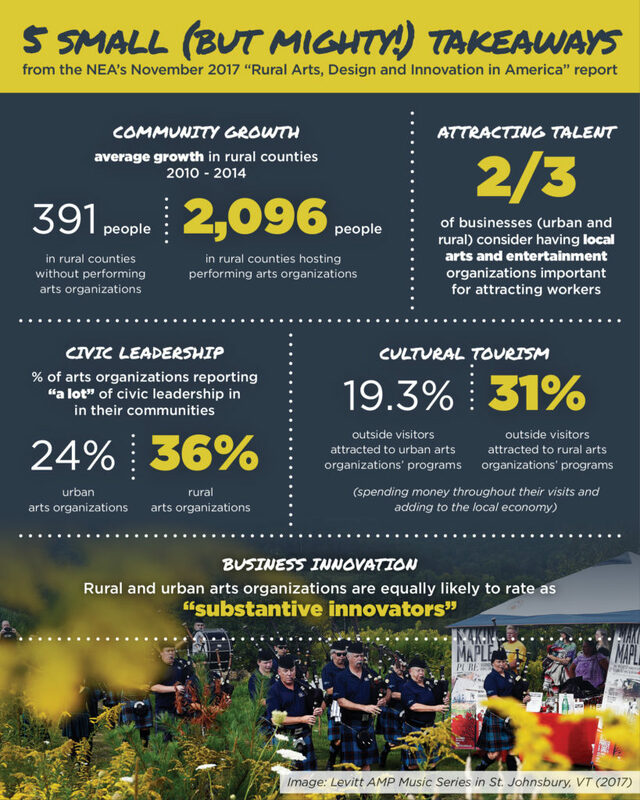 The report pulls compelling findings from data captured in the 2014 Rural Establishment Innovation Survey (REIS)—illustrating the economic impact of the arts in rural communities by identifying key patterns and relationships among arts organizations, design-integrated firms and business innovators in rural settings. We enjoyed this report so much, we created the infographic above to highlight a few of our favorite findings. Click here for the NEA’s full list of takeaways and here to read the full report. In November, as this report was entering the public sphere, tens of thousands of people across the country were casting their vote to help bring free Levitt AMP concerts to the small (or mid-sized) communities of their choice in 2018. While Levitt’s program of permanent outdoor music venues, each presenting 50+ free concerts annually, is tailored to large metro areas with populations of over 400,000 (due to financial sustainability and audience development considerations), the Levitt AMP [Your City] Grant Awards are specifically designed to meet the needs and capacity of small to mid-sized towns and cities. The grant competition was created in 2014 as a direct response to the need for free, high-quality arts experiences in smaller communities. Over the years, we’ve seen a consistent representation of towns from rural and semi-rural areas—including 2017 Levitt AMP grantees from Middlesboro, Ky. (population: 9,626), Sheboygan, Wis. (population: 48,686), and St. Johnsbury, Vt (population: 7,535). In recent years, we’ve witnessed a much-needed increase in funding for projects in rural communities across the philanthropic sector. Take Artplace, for example: more than half of the 2017 National Creative Placemaking Fund supported projects serving rural American communities. Interested in learning more about correlations between the arts, innovative business practices and rural communities? You’re in luck—the recent NEA report features findings from a forthcoming research article co-authored by Timothy Wojan of the Economic Research Service, U.S. Department of Agriculture, and Bonnie Nichols of the Office of Research & Analysis, National Endowment for the Arts (NEA), so stay tuned! This entry was posted in Arts Access, Beyond Levitt, Placemaking and tagged Levitt AMP Middlesboro, Levitt AMP Sheboygan, Levitt AMP St. Johnsbury, National Endowment for the Arts on December 15, 2017 by Nicole McGaffey.